Hi. What an lovely response to the process photos from the first Gardeners' Digest post. Wow and thank you! It looks like a lot of you really enjoyed hopping around. There are some new layouts and inspiration to check out on Two Peas today, including a layout I made with some of the leftover gesso. (Watch the video tutorial, linked below and you will know just what I am talking about.) Some of you may remember when I posted this book of quotes on my blog. Studio Calico asked if I would do a little tutorial on the technique using their journal kits. 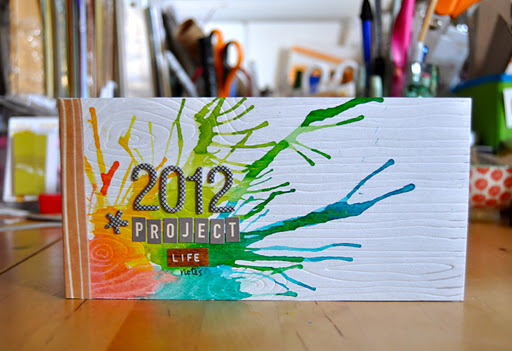 I thought it would be nice to have a place to put some random notes about Project Life. My plan is to include the day-to-day observations, silly quotes, and anecdotes that I may not remember as the week progresses in this woodgrain embossed book. Check out the video tutorial on the Studio Calico blog, where you can join in on their weekly challenge. There will be more instructional videos and plenty of techniques and tutorials shared in my upcoming Stretch Your Kit classwith Studio Calico. Last day to sign up is January 31st and class begins on February 1st!